← Tenet #10 – First With the Heart, Then With the Head. This is the lower jaw of a bowhead whale and it is on display at Inuksuk High School in Iqaluit. I got to meet two of the hunters and was amazed by the story of the hunt. I feel more than fortunate to be able to travel and work with educators across Canada and the United States. There is no greater profession than that of the school teacher and I try to reflect that notion in my presentations. The beauty of the role is found in the understanding that we don’t just get to predict the future but instead, get to create it. 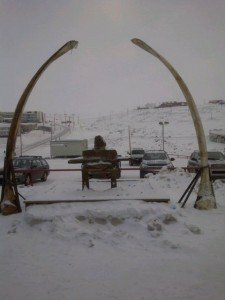 This is not without a myriad of challenges, as I was recently reminded, on my journey to Iqaluit where I spent four days at the Nunavut Teacher’s Conference. I was also reminded, by listening to the stories and seeing the outcomes, that teachers are in the best position to help students overcome many of these challenges. Perhaps a little bit of context will help (and my good friend Brian Barry aka @Nunavut_Tweeter will correct any misinformation) to understand some of the challenges facing our colleagues in Nunavut. This is Canada’s largest and least populated territory covering over two million square kilometers for a population of approximately 32,000. The twenty-five communities (with limited exceptions) are not connected to each other by road, leading to a high degree of isolation. The preceding is simply information and is not used by any of the educators as a crutch to prevent them from doing top quality work. As part of the push for an education that includes local context, the forty-two schools all include instruction in Inuktitut which is the language of the Inuit. Culture is an integral part of the learning experience for all students and Inuit elders work in all of the schools. In my keynote I share a personal story to illustrate why I am passionate about the beliefs I hold. Often this leads to others sharing their personal stories with me in a private moment after my session. I am humbled by the trust these folks place in me and appreciate the growth they have experienced to allow them to move forward and be difference makers in the lives of kids as a result. The stories I heard in Nunavut were not dissimilar to those I have had shared with me in other locations but the emotion and thought behind the stories left me feeling that the full healing for some of our First Peoples will take time. The commitment to doing the best for their students, however, is beyond reproach. Another interesting dynamic at this event was having teachers from Greenland in attendance. My afternoon session provided an insightful moment when I asked the various groups to define some key attributes they would want their school to be known for and what behaviors would indicate that those attributes were being demonstrated. One of the tables had a teacher from Greenland whose first language was Danish, a couple of teachers from Nunavut whose first language was Inuktitut, and a teacher who was a southerner (anyone from south of Nunavut) whose first language was French. While the objective of the activity was to get a common language around the attributes and behaviors, this group had to first find a common language! This reminded me of the struggles we sometimes have in schools when we think everyone is speaking a different language because they just “don’t get what I am saying” or agree with my “brilliant insights”. At the conclusion of the conference most of the 600 teachers were heading back to their communities having maximized their time with colleagues and increased their skill set to be able to meet the challenges of teaching in the North and reminded of the triumphs that come with being a teacher. Great post. Thanks for sharing your story with us. It surely is great when people, who share a similar experience, can tell their story to you after you have shared with them. The ability to share must, indeed, play a major part in the healing process. Thanks Brian. I think you are right in the notion that sharing/telling your story does promote healing and works to eliminate any feelings of isolation. I feel fortunate to have had the conversations I had during my visit. Keep in touch. This is an inspiring story. Thank you for sharing your incredible work! My daughter (Maya) is learning about Canada right now in her 6th grade social studies class in Georgia. We were just talking about Nunavut last night as she was studying for a test today. The stories make it so much more real and meaningful! Thanks Nicole. Great to hear that Maya is learning about such an amazing place. I hope it inspires her to plan a trip there one day as the people are incredible.